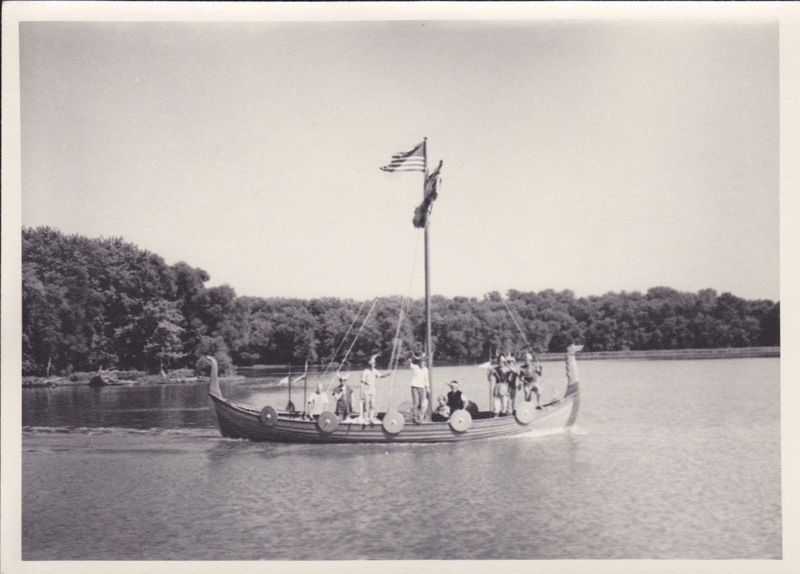 Many people probably saw newspaper articles based on the press release I put in my last post about the Viking ship coming down the Illinois River in early September, 1966. They probably thought "Hmm, interesting," and left it at that. Instead, Dad set up a line of spies - his patients - quite a few miles up the river to keep him posted on the approach of the marauding Vikings. 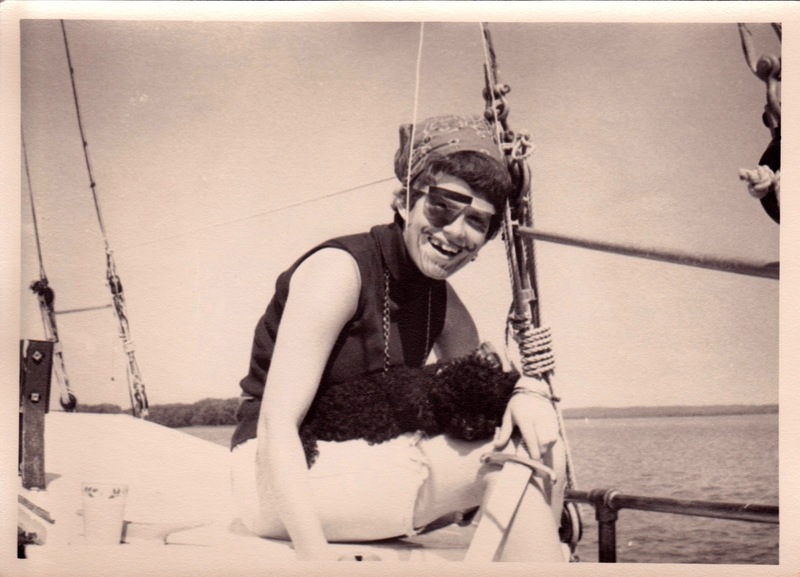 It wasn't until mysterious phone calls started coming in that my younger sister, Carolyn. and I got an inkling of what Dad was up to. Carolyn was about to start her freshman year of college, and I was about to head off for my senior year, so we were pretty cool. That coolness was challenged when Dad came into the kitchen that morning. His spy network had reported that the Dread Vikings had been sighted not far up the river, "They just passed under the bridge at Henry," etc., and would arrive in our waters within a few hours. 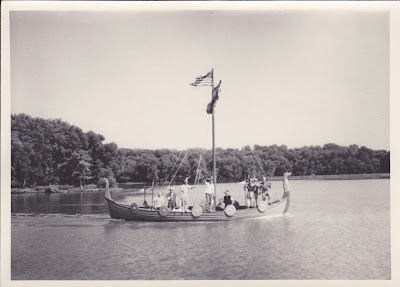 It was perfectly obvious to Dad that we needed to dress up like Pirates, climb aboard The Shiloh, and attack the Vikings. Well, as I mentioned before, Carolyn and I were cool college girls: way too cool for something like that! Our older brother wasn't around, for some reason, and our younger sisters had already begun the high school semester so they were exempt from this adventure. Our musician mom had already left for a music rehearsal in Peoria, so she was not going to be drafted into the whirlwind, either. The phone rang again, but this time it was a report that one of Dad’s OB patients was in labor. She was a first time mother, so it appeared that Dad wouldn't be back in time to attack anybody. As he got ready to leave for the hospital in a disappointed manner, Carolyn and I felt reprieved: surely he would not be back in time to make us do this totally uncool thing! From left to right: my mother and my younger sister, Carolyn! What could we do? We HAD to attack those Vikings! 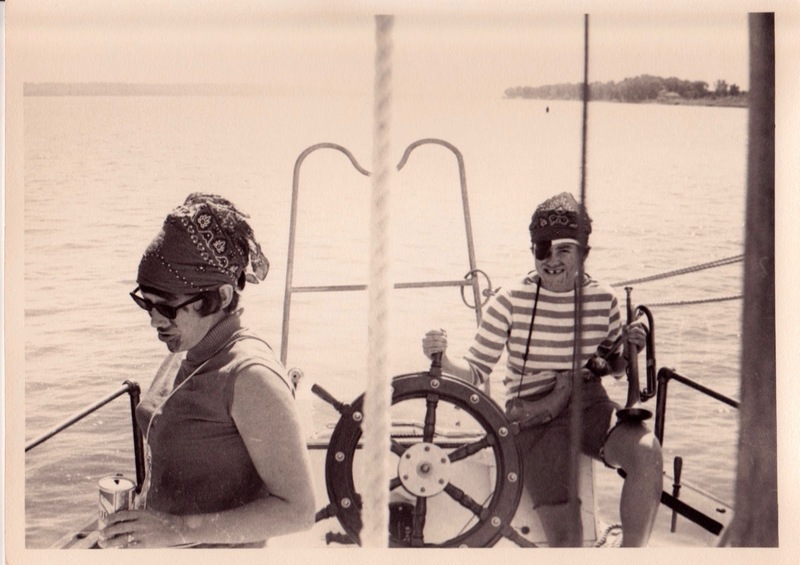 We called Jack Weber, the local funeral director and the only guy in town who knew how to drive Dad’s boat, and whom neither of us had ever met. We also called a couple of other women to fill out the pirate crew. Me and my fierce Pirate Dog, Mogie, ready to attack! It was only then that we started blacking out our teeth and painting on mustaches etc. to look suitably piratical. Just before we left for the boat, however, both Dad and Mom got back to the house and donned pirate garb - Dad painting a really effective scar on his chest, as I remember. We went down to The Shiloh, hoisted the Jolly Roger, and were off to defend Chillicothe against the Viking menace! Oops, Deedy got her wires crossed!